During my recent trip to the Napali Coast in Hawaii I camped out on the Kalalau beach with Darcy Ottey. One afternoon, after a walk in the jungle, we returned to the beach to discover an endangered Hawaiian monk seal had hauled out on the beach. We watched it for several hours before it returned to the ocean during an evening downpour. A few weeks later the New York Times ran a really interesting article, "Who would kill a monk seal?" by Jon Mooallem which explores the complex history and current situation around the conservation of this species, endemic to the Hawaiian island chain. Participant Lloyd Murray inspects wildlife sign on the edge of the Muddy River. 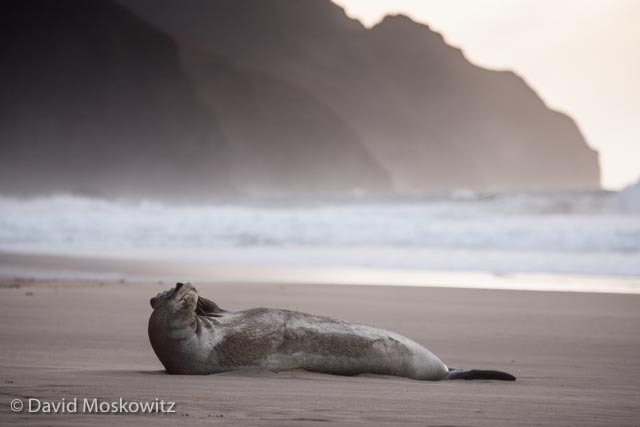 Apparently the world can be overwhelming, even for creatures that spend much of their time lounging on the beach in Hawaii. While very graceful in the water, monk seals move awkwardly on land where they are vulnerable to harassment or worse from humans. Hawaiian monk seal heading back to the ocean. Once in the water, monk seals can move more easily. Check out more photos of this monk seal and the Hawaiian islands here or more conservation oriented photographs here!